The Blue Winged Olive (BWO) is just one common name used to describe some, but not all, members of the insect family groups called Baetis (pronounced beet-us) Ephemerella, Baetidae, Drunella and Diphetor. Other names include Bluewing, Tiny Olives, Iron Blue Dun, Iron Blue Quill, Little Slate Winged Olive, Little Slate Winged brown quill, Tiny Western Olive and Little Western Iron Blue Quill. There are many species of Blue Winged Olive mayflies. Blue Winged Olive mayflies imitations can catch trout throughout the flyfishing season. 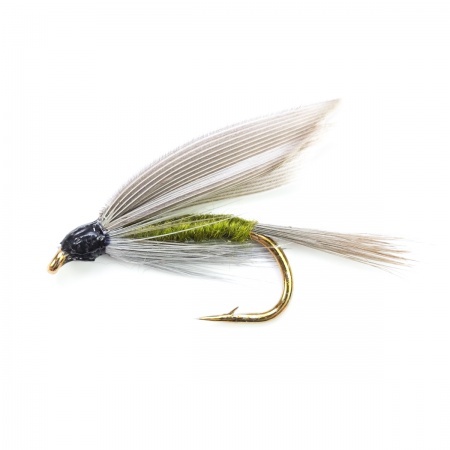 The disadvantage is that you have to carry a variety of hook sizes as one Blue Winged Olive will emerge in the morning and needs a hook size 12 BWO fly whilst another emerges at dusk and requires a hook size 20 fly. The presence of rising trout gently sipping something from the water's surface with no duns visible on the water generally means that the trout are taking the suspended nymphs and emerging duns. The Pheasant Tail Nymph and Gold Ribbed Hare's Ear nymphs are ideal imitations for the blue-winged olive's early stages.When it is hatching time the emerging duns have to wait in the water surface for about a minute for their wings to dry. Trout love this time of the year . 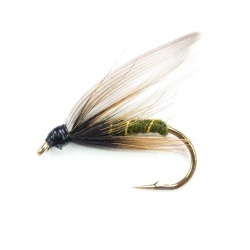 Try a Shipman’s Buzzer, Suspender buzzer, Klinkhammer or Parachute fly to mimic these emerging duns. WET FLIES A wet fly is designed to be fished below the water's surface.